Sean Lee and Daniella Li-Maria a few months after the babies were born. SHARON Thomas was only 15 when she caught his eyes. 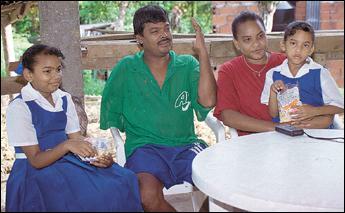 Radhay 'Krish' Mahabir was 18, but knew that Sharon would be important to him one day. Two years later the couple married under Hindu rites. She refused his first offer to take a ride with him on the ferris wheel at the amusement park where they met, but changed her mind later that evening. They rode until they were both very sick. It has been 14 years since that first ride and two children later, since the couple has been together. Sharon would not trade her "good Indian man" for nothing and proved this statement true after Krish lost his right arm three years ago. The 32-year-old father said: "I did not want to live. It is from her that I get all this courage." Had it not been for Sharon, Krish admits he would have given up on life. "She made me want to live for my two girls and family. My wife pulled me back from the edge," he said with pride, adding, "I get all my courage from her to get on with life and to live." Sharon said: "When reality hit me and I realised what happened I knew I had to be strong and I thought of nothing else. We had to move on; It was a difficult time and one of us had to take the reins." The couple was returning from a shopping expedition in Port of Spain around 9 p.m. when the nightmare occurred. "That day we went shopping with the children for school things. "We were on our way home when I saw these headlights coming towards me and did not realise it was a truck. I made sure I was on the edge of the road but it slammed into the side of the car cutting off my right arm, " Krish relived the painful memory as he sat in the back porch of his newly built home in Rio Claro. He still goes through the phantom pain of losing his arm and said it is something you can never fully forget. "I live without the use of my arm and have learned to accept there are something things I never can do again," he said . Nobody else was hurt in the accident. Next month the couple will celebrate their 12th anniversary and have no problems talking about their mixed relationship. Race has never been a big issue for the couple. Sharon is from Rio Claro and Krish is from San Pedro. They live in San Pedro close to his family, since most of Sharon's family is in the US. "I never had a problem with my family and Sharon's. Race was never a question. Our families had problems with us being too young to get married," Krish said. Sharon agreed that race never mattered to her family. The area where the couple lives is "real callaloo of couples" and they have not had to deal with any racial problems from the public. "My family knew if they objected that they would have suffered, causing them problems and not me. Now they love her more than me," Sharon did not hesitate when Krish asked her to marry him under Hindu rites. She said she is now Hindu. The couple said they would never object to any choice of partners their daughters Kristy, 9 and Kristel, 7, will make in future. "I think the happiness of parents depend on the happiness of their children," Krish said. He added: "I did not finish secondary school and I'm not too bright but I think race should never make a difference to people." When asked if domestic violence was ever an issue in their home the couple did not hesitate to point out that they never fought physically . They had arguments, but it is not violent. "People admire how we live," Sharon pointed out. Krish was quick to add: "She even insist I still hold her hand when we go out in public. She used to cry when we got home if I didn't. Now she just quarrels if I forget to hug or hold her in public." Since Krish lost his arm the family has lost its only steady source income. He was a market vendor in Port of Spain. Recently his social welfare allowance was stopped and now the family is dependent on assistance from relatives. "We manage. But I was told by the welfare officer that I could work and did not need the government's help," Krish said. Sharon contemplated going out to work, but said caring for her two daughters takes priority above everything. Sharon says she will never leave Krish because she loves her family and "good living". "I would probably beg her to stay and cry a bit if she decided to leave me. If that did not work then I would have to deal with it, but we have a good life and I don't think that will change." Krish believes that Indian men have been given a raw deal by the public when they are branded as violent. "I think both Indians and Africans are good and bad and none is less violent than the other," he said as he used himself as an example of a good Indian man. Krish added: "I am a good Indian man. I never hit or fight."